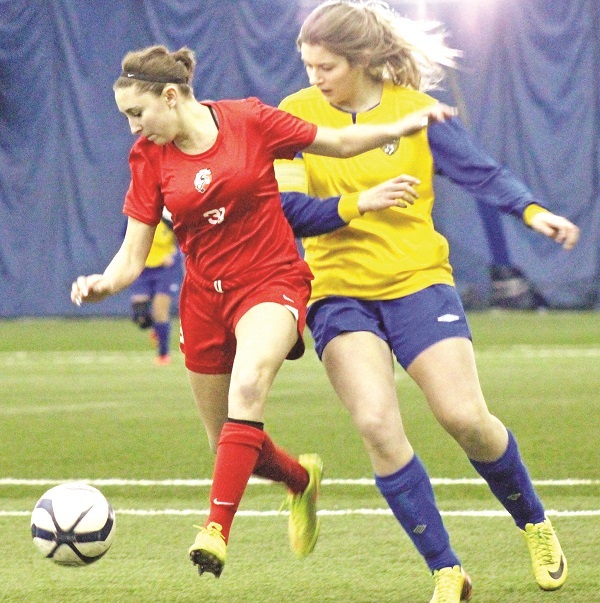 Soccer clubs from across Ontario gathered at the Aurora Sports Dome last Saturday, looking to further both their education and their soccer careers. The Aurora Youth Soccer Club (AYSC)) hosted their annual Invitational Showcase, a chance for post-secondary schools to bolster their rosters with young talent while allowing the high-school athletes to get their faces out there. This year’s showcase differed from past years, as it was the first to host both boys and girls teams – having been a primarily girls event in the past. Sixteen post-secondary institutions sent a coach or coaches to scout the talent, as each squad played two 45-minute “matches” throughout the day against an opposing team. To the players, those 90 minutes were crucial in earning a spot on a post-secondary roster after graduation. The schools represented ranged from all across Ontario, at both the college and university level. The event not only gave the coaches a chance to pick their newest crop of recruits, but also gave the student athletes a chance to make decisions of their own. Like many high school seniors, Veruto is still unsure of where his education will take him. Amidst the on-field action, a “Meet the Coaches” session gave the athletes and coaches an opportunity to get to know each other. University of Ottawa’s Steve Johnson said the showcase makes the job of the school coach much easier. Johnson also said an event such as the showcase allows the coaches to get to know the players on a more personal level. Four AYSC teams participated in the event, as both the boys and girls Aurora Stingers ’97 and ’98 teams gave their all for a chance to further their soccer careers. *Editor’s note: The print edition of this week’s Auroran features this story with an incorrect byline. We regret the error.